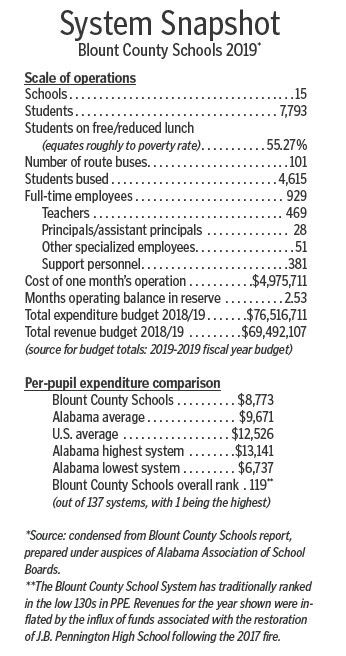 Blount County Schools Superintendent Rodney Green highlighted several items in his report to the Blount County Board of Education at its regular meeting Monday, among them (1) the impending visit of the AdvancEd accreditation team to the district Feb. 10 through Feb. 13, (2) the purchase of 48 new school buses at a cost of $3,716,000 through an agreement with Regions Equipment Financing Corporation, and (3) introduced and presented Matthew Plunkett to the board for employment approval as a teacher and head varsity football coach at Locust Fork High School, effective Feb. 5. Green commented on the upcoming visit of the accreditation team, explaining that they would interview school board members and principals, make observations at all district schools, and talk to parents, students, leadership teams, and others during the three-day visit. The meeting included a report from school system director of nursing Barbara Robertson on implementing a new Naloxone opioid antidote procedure recommended by the Alabama State Department of Education. The district has received permission to stock the controlled medication at all high school locations and Hayden Middle School. Arrangements are being made to train selected school employees to recognize opioid symptoms and to administer the medication in the event the school nurse is not immediately available. • releasing Emilee Elizabeth Pierce from the Blount County School System to attend the Jefferson County International Baccalaureate School during the 2019- 2020 school year. • Susan Moore High’s wrestling team to go to the state wrestling tournament Feb. 14-16. • Blountsville Elementary student council to go to Chattanooga, Tenn., March 8. • Cleveland fifth-grade students to go to Chattanooga, May 2. • Appalachian’s contracts with Camp Meadowbrook in Cullman for the 2019 prom and Puttin’ on the Ritz for the 2019 prom. • Cleveland Elementary’s contract with Just for You Coach to transport fifth-grade students to and from Chattanooga on May 2. • Cleveland High’s agreement with Universal Sound for the 2019 prom. • Hayden Elementary’s contracts with Alysa Amberson and Tabitha Guthrie for tutoring services from Feb. 5 to April 5. • J. B. Pennington High’s contract with Lisa Butler to serve as a judge for the 2019 Little Miss Tiger Pageant. • Locust Fork High’s contract with Robert A. Logan of Logan and Co. for the 2019 prom. • Locust Fork High’s agreement with Zamora Temple for the 2019 prom. • Susan Moore Elementary’s contract with Herff Jones for the 2019 yearbook. • Pam Branham Hughes for homebound contract #HB18/19-011. • Linda Tidwell for homebound contract #HB18/19-012. • the following non-compensated volunteers for the 2018-2019 school year: Samuel Heath Adams (J.B. Pennington High), Patti G. Willoughby (Locust Fork Elementary), Angela Simon (Locust Fork High), Jose Arriaga (Susan Moore High), Brianna Manning Pettit (Blount County Career Technical Center). • the following leaves of absence: Wendy Helms (extension), Jazmin Chavez Lopez, Wendy McCollum, Amanda McGowen, Meredith Moore (extension), Barbara Roy. • employing the following: Tara Best as a special education aide at Hayden Elementary, effective Feb. 5; Tammy Renee Dobbins as Child Nutrition Program employee at J. B. Pennington High, effective March 1; Tina Boatright as a long-term substitute teacher for Wendy McCollum, a teacher at Locust Fork Elementary, from approximately Feb. 11 to March 4; Linda Branch Finch as a long-term substitute teacher for Sarah Miller, a teacher at Hayden Elementary, from approximately Feb. 1 to March 22; Vicki Hamby-Scott as a long-term substitute teacher for Michelle Lawless Searcy, a teacher at Southeastern, from approximately Feb. 1 to March 22; Matthew Plunkett as a teacher and head football coach at Locust Fork High, effective Feb. 5. • the retirement resignation of Billy Glenn Puckett, principal of Southeastern, effective March 1. • a resolution authorizing a $3,716,000 Secured Equipment Financing Agreement with Regions Equipment Finance Corporation for 48 new school buses. • awarding the bid for labor for installation of softball field lighting at Appalachian to Titan Electric Inc. of Dora, with a bid of $23,000. • the agreement with Premier Kings Inc. for the Locust Fork Sewer System Connection permit application. All members of the school board were present at the business meeting: president Chris Latta (District 5); Ken Benton (District 1); Jackie Sivley (District 2); Philip Cleveland (District 3); and Bill Ferry (District 4). The regular business meeting time is the first Monday of each month at 1 p.m. at the central office next to the courthouse in Oneonta, with special meetings called as needed.